While the basic ON/OFF switch is not considered an energy-saving lighting control, it can be if at least two switches are used to control lighting in a space that is configured on two lighting circuits, giving the user a choice of two levels of light output. 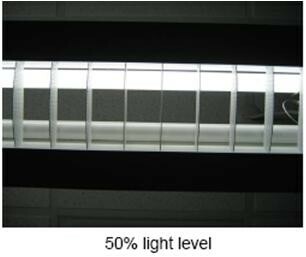 Alternate rows, fixtures or lamps can be switched, offering a choice of 50% and 100% light output. Or the center lamps can be switched separately from the outer lamps in three-lamp fixtures, offering a choice of 33%, 66% and 100% light output. In one study by ADM Associates, the latter option was demonstrated to produce 22% energy savings in private offices. At least one-half of the energy codes in the United States are based on the International Energy Conservation Code (IECC), which requires light level reduction controls such as multilevel switching or dimming in enclosed spaces such as private offices. Occupancy sensors are just as simple—a switch married with a sensor to enable automatic switching based on whether the sensor detects the presence or absence of people. Occupancy sensing is a reliable method for generating energy savings: According to the Advanced Lighting Guidelines, occupancy sensors in private offices can produce up to 45% energy savings. 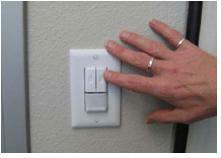 All energy codes require that general lighting be automatically turned OFF when it’s not used. Further, IECC says that if an occupancy sensor is used in an enclosed space such as a private office, light level reduction controls are not needed, suggesting an either/or choice. What if bilevel switching was combined with occupancy sensor functionality? Would this produce higher energy savings in a private office than bilevel switching or occupancy sensing alone. And: What combination of manual initiative and automation would produce the highest energy savings while also satisfying workers? 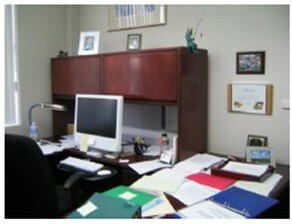 Typical office used in the study. 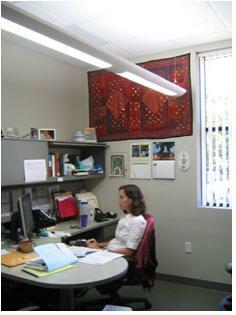 The California Lighting Technology Center (CLTC) organized a study in eight private offices at the University of California – Davis in 2008 to attempt to generate useful data related to these questions. Each office, between 90 and 140 sq.ft. with a ceiling height of 9 ft., is lighted by a combination of indirect/direct pendant fixtures and daylight entering through a window with manually adjustable vertical blinds. The study was sponsored by Watt Stopper/Legrand. In the test offices, the pendants are configured with dual circuiting, with a ballast driving two lamps (48W) placed on each circuit. This enabled the researchers to set up three test conditions and record data on occupancy. Office at 50% light level. • Auto-ON to 100%: When the office became occupied, an occupancy sensor signaled both relays to automatically turn the lights ON to 100% light level. 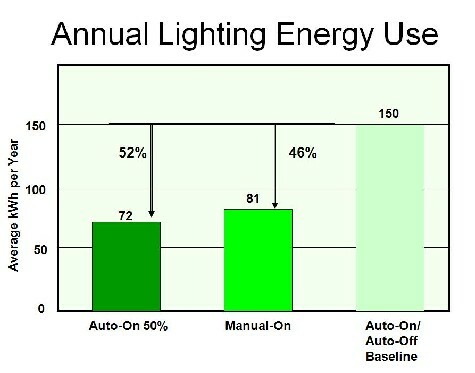 If the occupant wanted a lower light level, they can flick a switch to 50% or manual-OFF. When the occupant left the office, the sensor then automatically swept the lights OFF. • Auto-ON to 50%: When the office became occupied, the sensor signaled one relay to automatically turn one-half of the lamps ON to achieve 50% light level. The user could flick a switch to increase light level to 100% or turn the lights OFF. When the occupant left the office, the sensor then automatically swept the lights OFF. • Manual-ON to 50% or 100%: When the office became occupied, the sensor did not turn the lights ON. Instead, the user could turn the lights ON to 50% or 100% light level, or leave them OFF. When the occupant left the office, the sensor then automatically swept the lights OFF. The bilevel switching occupancy sensor. • The auto-ON to 100% bilevel occupancy sensor saved 34% compared to the baseline. • The auto-ON to 50% bilevel occupancy sensor saved 52% compared to the baseline. • The manual-ON bilevel occupancy sensor saved 46% compared to the baseline. “The results showed that if we look beyond technology and include human factors and common sense, we can still find simple solutions that can be easily applied to save more than 50% lighting energy in existing commercial buildings,” says Pete Horton, VP market development for Watt Stopper/Legrand. 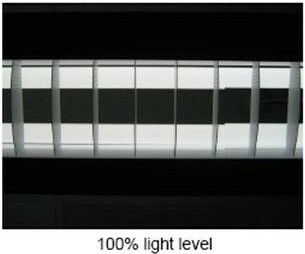 An advantage of bilevel switching is that users have a choice of light levels, enabling them to adjust light levels based on preference for different tasks or lighting conditions, such as the variable availability of daylight. He believes this research will be influential, pointing out that because 46-52% energy savings higher energy savings can be demonstrated with bilevel occupancy sensing compared to standard occupancy sensing, energy codes are likely to address this approach in the future. Quite interesting piece to read, however I will say this method have been practiced severally in the Lighting design and installation in Nigeria. Manually 2No. switches are introduced in a Room with mixed fittings and sre controlled at the occupant desired lighting level. Bilevel lighting with control sensor is quite innovative. I suggest lightng fittings are arranged where essentially needed for effective lighting level at anytime 50% is required. This reminds me of the book I read “Humanoid”,senors infra-reds and computers are taking over human thinking and activities. What do you thik?